Extensive skiing, relaxed atmosphere and attractive surroundings. Morzine is situated in the heart of the vast "Portes du Soleil" ski area which covers 13 resorts, 6 in Switzerland and 7 in France. 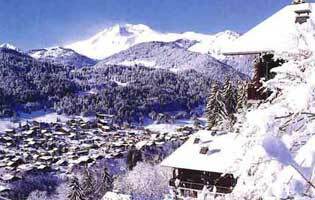 Morzine is a market town and has all the appeal of an old-style chalet resort set in a charming wooden surrounding. High above Morzine's village square, the glistening peaks lure skiers to the "Portes du Soleil" open bowls, winding runs, steep chutes, dark forests and gentle valleys, which connect Morzine to such mountain hamlets such as Les Gets and Chatel in France and Les Crosets, Champoussin and Morgins in Switzerland. With 228 lifts serving 450 miles of groomed runs, you can ski from early morning to late afternoon and never ride the same lift or encounter the same run twice. As a normal working town, there are plenty of shops, cafes and restaurants. try The Cavern and Dixies. inside the Wallington complex there is a bowling alley, pool hall, disco and bar. for nightclubs try L'Opera and Le Paradis.